Cleansing was one of the first things my mum showed me aged 11 when she was explaining a skincare routine to me. At the time, I didn't fully realise how significant cleansing is but I can definitely say that starting from such a young age has really helped my skin. I cleanse twice a day, using micellar water in the morning and then a cream or gel cleanser like this bareMinerals Deep Cleansing Foam* in the evening that I take off with a muslin cloth or flannel. I've made this my routine and have really seen a difference in my skin, especially in the winter. I find when I use moisturising cleansers that my skin doesn't dry or break out as much. Again, this is another thing I do twice a day in various forms. 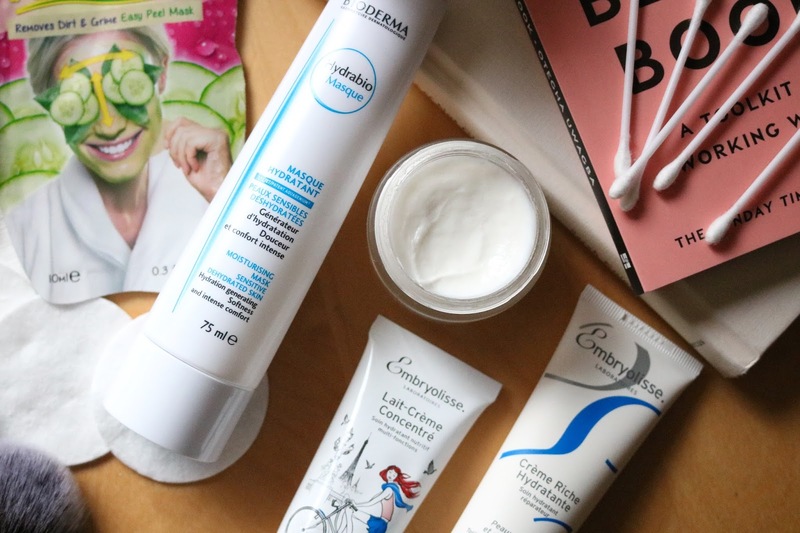 In the morning I'll use a day moisturiser that I know will last me through the day, and then in the evening, I've opted for using thicker night creams and overnight masks. I know I've picked a good 'un if I can still feel it a bit on my skin the morning after. I've gathered together a great team of moisturisers that I've been using consistenly for the past couple of months. After being sent some Embyolisse products to try, I've completely fallen in love with the brand. The Lait-Creme Concentre* is a fantastic multitasker- it can be used as a primer, a moisture mask when layered up, and even a cleanser! This cult fave is packed with natural ingredients including shea butter, aloe vera, and beeswax which all help nourish the skin to keep it supple and soft. Also can we talk about how beautiful the limited edition packaging is?! This has a watery consistency almost like a medicinal cream, so I plan on using this as a primer and then as my main moisturiser in the warmer months. The Rich Moisturising Repair Cream* is slightly thicker but is a real joy to apply as it keeps my skin hydrated throughout the whole day. It has helped calm down my dry and irritated skin and has been protecting against any more flareups with lots of vitamins and antioxidants. This is the perfect winter day moisturiser that I'll be repurchasing from now on. The Intense Smooth Radiance Complexion cream* completes my skin routine as my night moisturiser. This anti-fatigue and anti-aging cream can be used twice a day but I prefer to use this overnight as I always wake up with super soft skin. The natural sugars plump and boost the skin meaning that the cold winter air will struggle to dry out your skin, and the Omega 9 restructures to smooth over any fine lines and puffiness. 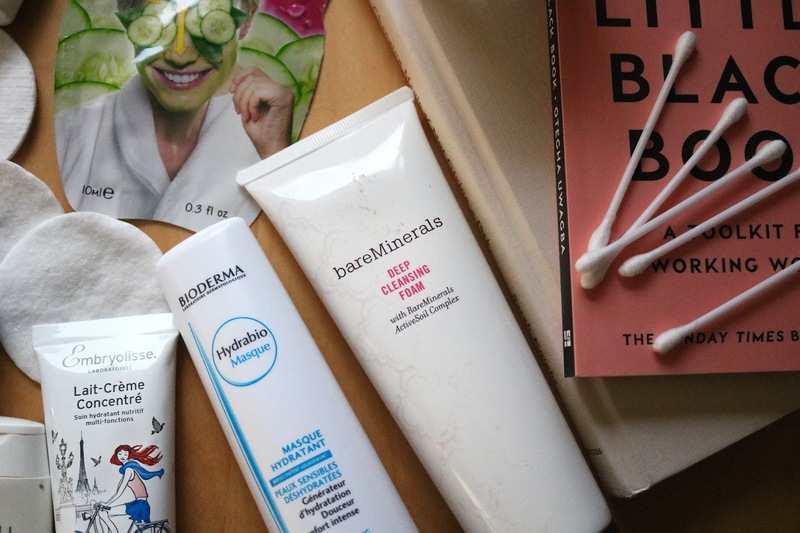 If I really want to treat my skin and give it a moisture overhaul, then the Bioderma Hydrabio Moisturising Mask* really does the trick. When my skin is feeling extra sensitive and dehydrated then I pop this on for ten minutes just before bed, remove the excess and then in the morning it's like I have brand new skin. This may be because of the Aquagenium complex in it that retrains the skin to lock in moisture. When I go to the gym in the winter, I reach for a light moisturiser that I use in the summer, as I find that I like to have something on my skin before I go out the house that I can sweat through. I normally find that if I use my normal day moisturiser my skin feels a bit heavy when I start to work out. Since being away for 5 months and applying SPF at least four times a day so I didn't turn into a shriveled prune (not a great look) is something that I've been trying to carry on even though I'm back in dark and dreary England. I'm not one to put on suncream in the winter because I'm normally hibernating in ten layers of clothing, so I prefer to use products with SPF already in them. More and more products are now featuring SPF, from moisturisers to foundations to primers like this MONU Illuminating one, which gives you a glowing radiance without the suncream sheen. 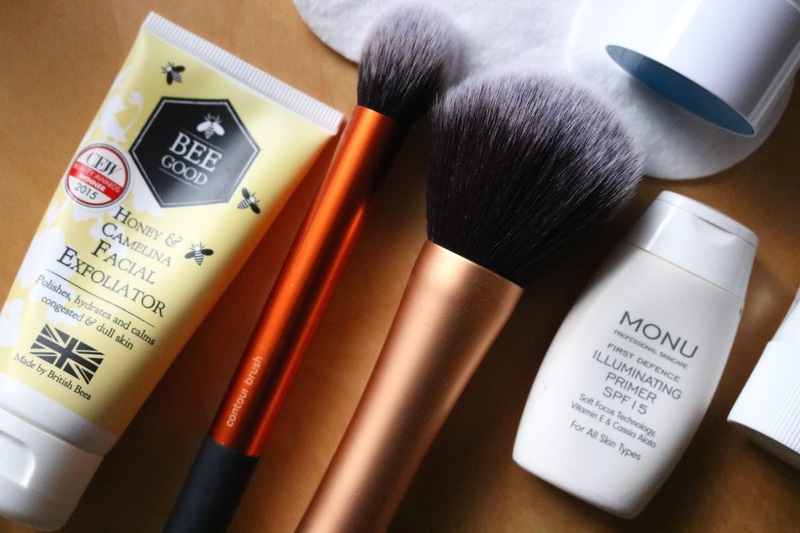 Having SPF in products you already use makes for a great time-saver in the morning when you don't really want to be applying ten different products. I've realised that there's something ingrained in me that won't let me go to bed without taking my makeup off. Even when I've had one too many G&T's after a night out, I always find myself reaching for my cotton bads and micellar water so I don't wake up looking like a panda. 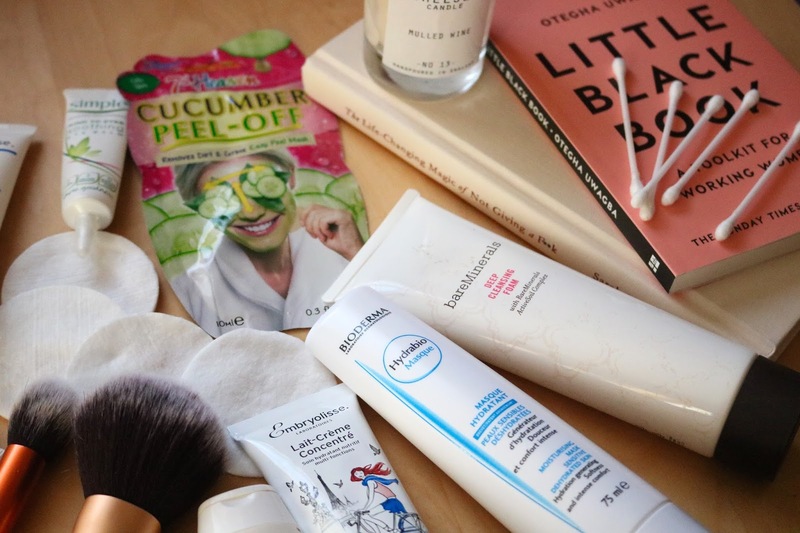 Micellar water like my beloved Bioderma will always be my product of choice when I remove my makeup- I've tried using 2-in-1 cleansers but my eyes just don't appreciate it when the product gets in them, so I stick to what works for me. This has been fairly new to my routine. I have used it occasionally when I have been sent a sample or bought one on a whim, but I haven't really stuck with it until my eczema outbreaks. For the past 2 years I've had the flareups around my eyes now and then, and after the last one, I found people talking about this Simple Kind to Eyes eye cream on a forum. The thing I love about this is that it really does what it says on the tin- it soothes your eyes without irritating them, allowing your skin time to heal, and it reduces any puffiness caused by eczema. This is something else that I've come to appreciate because of how it benefits my skin. 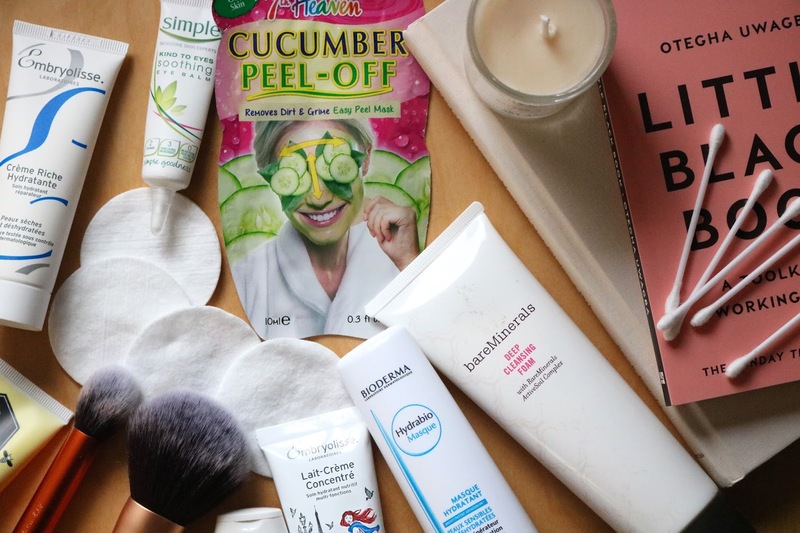 From peel-offs to sheet masks, and eye masks to nose strips, I have firmly fallen back in love with popping on a mask before having a relaxing bath. I have recently got back into 7th Heaven masks, which I'll always remember using at sleepovers as a young teenager (anyone else with me on this)! 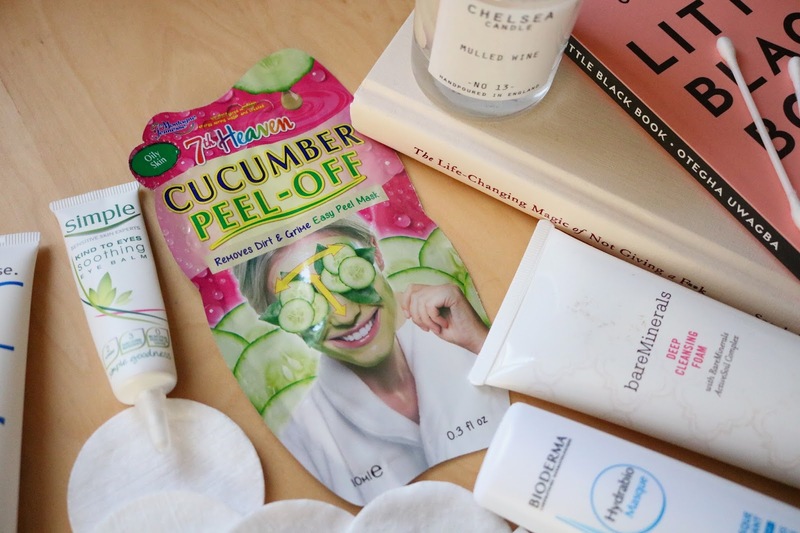 I've been using the Cucumber Peel-Off mask* regularly as it gives me a boost of moisture without stripping it bare. If I get a little breakout around my T-zone, this leaves it feeling fresh and the spots vanish overnight. I always know when it's time to exfoliate, especially in the winter. When I get to a point when I put on my foundation only for it to start coming straight off my face, I know I desperately need to exfoliate! Because of this, I now make sure I put time aside to exfoliate at least once a week so that it gets done. I've been using the Bee Good Honey and Camelina Facial Exfoliator as it's really gentle but effective at removing any dead skin cells. It's also slightly creamy meaning it moisturises as it cleans the skin, and the camelina oil helps protects again any inflamation. It can be so easy to leave the same sheets on your bed for a good couple of weeks (sometimes longer, oops) as it's one of those tasks that can take a good chunk of time to do. It feels like a chore, but I promise that it makes a huge difference in your skin if you change them regularly. Think about this for a sec: you spend about 8 hours with your face pressed to your pillow. Now think about lying with your face pressed to your pillow that has a big build-up of bacteria from 3 weeks of sleeping. I must admit, I've never been one to go out and get a facial regularly. Not even every month. However, this doesn't mean you can't do it at home. This is one thing that I'm determined to keep up this year that will hopefully help improve my skin even more. You can easily give yourself an at-home facial by using an electric brush, a jade roller or even just your hands. As long as you are dedicating a good chunk of time to giving yourself a facial, it will still be relaxing the muscles and get the blood moving around as much as if you paid someone to do it. For me, I have been able to directly link a breakout or spot to if I haven't washed my makeup brushes. If it goes past a month and I still haven't got round to washing my brushes, the spots start to slowly pop up. Even if I know that I won't be able to dedicate time to cleaning my brushes for a while, I use a spray brush cleaner in between washes to help remove some of the bacteria that may have built up. Each month I will grab my baby shampoo and have a good washing sesh, then I know that I'll have backup brushes if the ones I am using get really grimy. Now it's your turn! What products do you use every day, week or month to help your skin? Are there any other steps that you do to ensure your skin behaves itself in the winter?